Whet your appetite for further Osaka adventures on this short-but-sweet private helicopter flight. After a comprehensive orientation and safety briefing, take to the air with a loved one or two and soak up panoramic views from 1969 feet (600 meters). 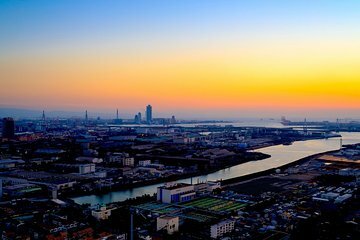 Besides Osaka Bay and the Dotombori River, see landmarks such as the Tempozan Ferris Wheel, Universal Studios Japan, the 840-foot (256-meter) World Trade Center Cosmo Tower, and more.